The beneficial role of scintigraphy is limited. [7, 8] However, molecular marker analysis of FNAB samples is proving to be beneficial in determining surgical plans. The subsequent diagnostic workup is aimed at determining whether the lesion represents a malignancy. Collected data can be useful in preoperative planning if surgery is indicated. Pediatric and adult thyroid cancers have differing biological behaviors. Despite the fact that pediatric thyroid cancer usually presents at an advanced stage, it carries an excellent prognosis, with long-term survival rates greater than 95%. An image depicting thyroid cancer can be seen below. Treatment for thyroid malignancy is primarily surgical. Because of the unusual combination of an excellent prognosis and an advanced-stage disease presentation, the initial extent of surgery is controversial. Some recommend that the initial surgical approach be conservative, while others advocate aggressive management with total thyroidectomy and radioactive iodine (RAI) for all patients. The relative infrequency of thyroid malignancy makes this controversy difficult to resolve. Although total thyroidectomy has not been proven to decrease recurrence, supporters of this method argue that remaining thyroid tissue may interfere with the use of radioactive iodine (RAI) in the postoperative diagnostic scanning and in the treatment of microscopic regional and distant disease. Total thyroidectomy and central neck dissection are indicated for biopsy-proven medullary carcinoma. Selective ipsilateral neck dissection in pediatric thyroid surgery is indicated for proven or suspected regional lymph node metastasis. Medullary thyroid cancer (MTC), which constitutes 5% of pediatric thyroid malignancies, is usually associated with multiple endocrine neoplasia type 2 (MEN2) in the pediatric population. The inheritance pattern occurs either sporadically or as familial MTC without other associated endocrine abnormalities. MEN2 consists of MTC and pheochromocytoma and either hyperparathyroidism (2A) or mucosal neuromas (2B). MTC associated with MEN2B is more virulent and may occur and metastasize early in infancy. Pediatric thyroid malignancies are usually a well-differentiated papillary subtype or the papillary-follicular subtype, but all histologic types have been observed. Children commonly present with advanced disease. At presentation, 70% of patients have extensive regional nodal involvement, and 10-20% of patients have distant metastasis. The lungs are the most common sites of metastasis. [Guideline] Francis G, Waguespack SG, Bauer AJ, et al. Management Guidelines for Children with Thyroid Nodules and Differentiated Thyroid Cancer The American Thyroid Association Guidelines Task Force on Pediatric Thyroid Cancer. Thyroid. 2015 Apr 21. [Medline]. [Full Text]. Busko M. ATA Issues First Advice for Thyroid Nodules, Cancer in Children. Medscape Medical News. Apr 27 2015. [Full Text]. Albright JT, Topham AK, Reilly JS. Pediatric head and neck malignancies: US incidence and trends over 2 decades. Arch Otolaryngol Head Neck Surg. 2002 Jun. 128(6):655-9. [Medline]. Corrias A, Mussa A. Thyroid Nodules in Pediatrics: Which Ones Can Be Left Alone, Which Ones Must be Investigated, When and How. J Clin Res Pediatr Endocrinol. 2013 March. 5(Suppl 1):57–69. [Medline]. Silverman SH, Nussbaum M, Rausen AR. Thyroid nodules in children: a ten year experience at one institution. Mt Sinai J Med. 1979 Sep-Oct. 46(5):460-3. [Medline]. Ridgway EC. Clinician Evaluation of a Solitary Thyroid Nodules. Journal of Clinical Endocrinology and Metaoblism. 1992. Vol. 74, No. 2:231-235. Niedziela M, Korman E. Thyroid carcinoma in a fourteen-year-old boy with Graves disease. Med Pediatr Oncol. 2002 Apr. 38(4):290-1. [Medline]. Halac I, Zimmerman D. Thyroid nodules and cancers in children. Endocrinol Metab Clin North Am. 2005 Sep. 34(3):725-44, x. [Medline]. Festen C, Otten BJ, van de Kaa CA. Follicular adenoma of the thyroid gland in children. Eur J Pediatr Surg. 1995 Oct. 5(5):262-4. [Medline]. Schneider K. Sonographic imaging of the thyroid in children. Prog Pediatr Surg. 1991. 26:1-14. [Medline]. Sherman NH, Rosenberg HK, Heyman S, et al. Ultrasound evaluation of neck masses in children. J Ultrasound Med. 1985 Mar. 4(3):127-34. [Medline]. Dinauer CA, Breuer C, Rivkees SA. Differentiated thyroid cancer in children: diagnosis and management. Curr Opin Oncol. 2008 Jan. 20(1):59-65. [Medline]. Garcia CJ, Daneman A, Thorner P, et al. Sonography of multinodular thyroid gland in children and adolescents. Am J Dis Child. 1992 Jul. 146(7):811-6. [Medline]. Yeh SD, La Quaglia MP. 131I therapy for pediatric thyroid cancer. Semin Pediatr Surg. 1997 Aug. 6(3):128-33. [Medline]. Herzog B. Thyroid gland diseases and tumours. Surgical aspects. Prog Pediatr Surg. 1983. 16:15-22. [Medline]. Rapkin L, Pashankar FD. Management of thyroid carcinoma in children and young adults. J Pediatr Hematol Oncol. 2012 May. 34 Suppl 2.:S39-46. [Medline]. Khurana KK, Labrador E, Izquierdo R, et al. The role of fine-needle aspiration biopsy in the management of thyroid nodules in children, adolescents, and young adults: a multi-institutional study. Thyroid. 1999 Apr. 9(4):383-6. [Medline]. Lugo-Vicente H, Ortiz VN, Irizarry H, et al. Pediatric thyroid nodules: management in the era of fine needle aspiration. J Pediatr Surg. 1998 Aug. 33(8):1302-5. [Medline]. Niedziela M. Pathogenesis, diagnosis and management of thyroid nodules in children. Endocr Relat Cancer. 2006 Jun. 13(2):427-53. [Medline]. Corrias A, Cassio A, Weber G, et al. Thyroid nodules and cancer in children and adolescents affected by autoimmune thyroiditis. Arch Pediatr Adolesc Med. 2008 Jun. 162(6):526-31. [Medline]. Zimmerman, D. Thyroid Carcinoma in Children and Adolescents: diagnostic implications of analysis of the tumor genome. Curr Opin Pediatr. 25:[Medline]. Miccoli P, Minuto MN, Ugolini C, et al. Papillary thyroid cancer: pathological parameters as prognostic factors in different classes of age. Otolaryngol Head Neck Surg. 2008 Feb. 138(2):200-3. [Medline]. Williams ED, Abrosimov A, Bogdanova T, et al. Thyroid carcinoma after Chernobyl latent period, morphology and aggressiveness. Br J Cancer. 2004 Jun 1. 90(11):2219-24. [Medline]. Ron E. Thyroid cancer incidence among people living in areas contaminated by radiation from the Chernobyl accident. Health Phys. 2007 Nov. 93(5):502-11. [Medline]. Yoskovitch A, Laberge JM, Rodd C, et al. Cystic thyroid lesions in children. J Pediatr Surg. 1998 Jun. 33(6):866-70. [Medline]. Alessandri AJ, Goddard KJ, Blair GK, et al. Age is the major determinant of recurrence in pediatric differentiated thyroid carcinoma. Med Pediatr Oncol. 2000 Jul. 35(1):41-6. [Medline]. La Quaglia MP, Telander RL. Differentiated and medullary thyroid cancer in childhood and adolescence. Semin Pediatr Surg. 1997 Feb. 6(1):42-9. [Medline]. Attie JA. Carcinoma of the thyroid in children and adolescents. F Lifshitz. Pediatric Endocrinology. 3. New York: Marcel Dekker; 1996. 423-432. Estevao-Costa J, Gil-Da-Costa MJ, Medina AM, et al. Thyroid carcinoma in a newborn: clinical challenges in managing the first recorded case. Med Pediatr Oncol. 2000 Apr. 34(4):290-2. [Medline]. Yip FW, Reeve TS, Poole AG, et al. Thyroid nodules in childhood and adolescence. Aust N Z J Surg. 1994 Oct. 64(10):676-8. [Medline]. Skinner MA, Wells SA Jr. Medullary carcinoma of the thyroid gland and the MEN 2 syndromes. Semin Pediatr Surg. 1997 Aug. 6(3):134-40. [Medline]. Cotterill SJ, Pearce MS, Parker L. Thyroid cancer in children and young adults in the North of England. Is increasing incidence related to the Chernobyl accident?. Eur J Cancer. 2001 May. 37(8):1020-6. [Medline]. Gawrysiak W, Niedziela M. Suppurative thyroiditis. Endokrynologia Pediatryczna (Pediatric Endocrinology). 2005. 4:65-69. Bhatia S, Ramsay NK, Bantle JP, et al. Thyroid Abnormalities after Therapy for Hodgkin's Disease in Childhood. Oncologist. 1996. 1(1 & 2):62-67. [Medline]. Jensen MO, Antonenko D. Thyroid and thymic malignancy following childhood irradiation. J Surg Oncol. 1992 Jul. 50(3):206-8. [Medline]. Metayer C, Lynch CF, Clarke EA, et al. Second cancers among long-term survivors of Hodgkin's disease diagnosed in childhood and adolescence. J Clin Oncol. 2000 Jun. 18(12):2435-43. [Medline]. Nikiforov Y, Gnepp DR. Pediatric thyroid cancer after the Chernobyl disaster. Pathomorphologic study of 84 cases (1991-1992) from the Republic of Belarus. Cancer. 1994 Jul 15. 74(2):748-66. [Medline]. Vane D, King DR, Boles ET Jr. Secondary thyroid neoplasms in pediatric cancer patients: increased risk with improved survival. J Pediatr Surg. 1984 Dec. 19(6):855-60. [Medline]. Thomas GA, Bunnell H, Cook HA, et al. High prevalence of RET/PTC rearrangements in Ukrainian and Belarussian post-Chernobyl thyroid papillary carcinomas: a strong correlation between RET/PTC3 and the solid-follicular variant. J Clin Endocrinol Metab. 1999 Nov. 84(11):4232-8. [Medline]. Sklar C, Whitton J, Mertens A, et al. Abnormalities of the thyroid in survivors of Hodgkin's disease: data from the Childhood Cancer Survivor Study. J Clin Endocrinol Metab. 2000 Sep. 85(9):3227-32. [Medline]. Patti G, Ragni G, Calisti A. Papillary thyroid carcinoma in a thyroglossal duct cyst in a child. Med Pediatr Oncol. 2000 Jan. 34(1):67-9. [Medline]. Luboshitzky R, Lavi I, Ishay A. Serum thyroglobulin levels after fine-needle aspiration of thyroid nodules. Endocr Pract. 2006 May-Jun. 12(3):264-9. [Medline]. Bockhorn M, Frilling A, Rewerk S, et al. Lack of elevated serum carcinoembryonic antigen and calcitonin in medullary thyroid carcinoma. Thyroid. 2004 Jun. 14(6):468-70. [Medline]. Telander RL, Moir CR. Medullary thyroid carcinoma in children. Semin Pediatr Surg. 1994 Aug. 3(3):188-93. [Medline]. Bajpai M, Ramaswamy S, Gupta DK, et al. Solitary thyroid nodule. Indian Pediatr. 1992 Jan. 29(1):116-8. [Medline]. Solbiati L, Cioffi V, Ballarati E. Ultrasonography of the neck. Radiol Clin North Am. 1992 Sep. 30(5):941-54. [Medline]. Lim-Dunham JE, Erdem Toslak I, Alsabban K, et al. Ultrasound risk stratification for malignancy using the 2015 American Thyroid Association Management Guidelines for Children with Thyroid Nodules and Differentiated Thyroid Cancer. Pediatr Radiol. 2017 Apr. 47 (4):429-36. [Medline]. Hegedüs L, Bonnema SJ, Bennedbaek FN. Management of simple nodular goiter: current status and future perspectives. Endocr Rev. 2003 Feb. 24(1):102-32. [Medline]. Harach HR, Sanchez SS, Williams ED. Pathology of the autonomously functioning (hot) thyroid nodule. Ann Diagn Pathol. 2002 Feb. 6(1):10-9. [Medline]. Croom RD 3rd, Thomas CG Jr, Reddick RL, et al. Autonomously functioning thyroid nodules in childhood and adolescence. Surgery. 1987 Dec. 102(6):1101-8. [Medline]. Geiger JD, Thompson NW. Thyroid tumors in children. Otolaryngol Clin North Am. 1996 Aug. 29(4):711-9. [Medline]. Desjardins JG, Khan AH, Montupet P, et al. Management of thyroid nodules in children: a 20-year experience. J Pediatr Surg. 1987 Aug. 22(8):736-9. [Medline]. Eisenhut CC, King DE, Nelson WA, et al. Fine-needle biopsy of pediatric lesions: a three-year study in an outpatient biopsy clinic. 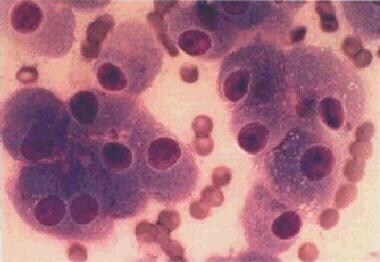 Diagn Cytopathol. 1996 Feb. 14(1):43-50. [Medline]. Raab SS, Silverman JF, Elsheikh TM, et al. Pediatric thyroid nodules: disease demographics and clinical management as determined by fine needle aspiration biopsy. Pediatrics. 1995 Jan. 95(1):46-9. [Medline]. Bettendorf M. Thyroid disorders in children from birth to adolescence. Eur J Nucl Med Mol Imaging. 2002 Aug. 29 Suppl 2:S439-46. [Medline]. Gimm O, Sutter T, Dralle H. Diagnosis and therapy of sporadic and familial medullary thyroid carcinoma. J Cancer Res Clin Oncol. 2001. 127(3):156-65. [Medline]. AJCC Cancer Staging Manual. Sixth Edition. New York: Springer-Verlag, , Inc; 2002. Bryarly RC, Shockley WW, Stucker FJ. The method and management of thyroid surgery in the pediatric patient. Laryngoscope. 1985 Sep. 95(9 Pt 1):1025-8. [Medline]. Lallier M, St-Vil D, Giroux M, et al. Prophylactic thyroidectomy for medullary thyroid carcinoma in gene carriers of MEN2 syndrome. J Pediatr Surg. 1998 Jun. 33(6):846-8. [Medline]. Newman KD, Black T, Heller G, et al. Differentiated thyroid cancer: determinants of disease progression in patients Ann Surg</i>. 1998 Apr. 227(4):533-41. [Medline]. Ben Arush MW, Stein ME, Perez Nahum M, et al. Pediatric thyroid carcinoma: 22 years of experience at the Northern Israel Oncology Center (1973-1995). Pediatr Hematol Oncol. 2000 Jan-Feb. 17(1):85-92. [Medline]. Amrikachi M, Ponder TB, Wheeler TM, et al. Thyroid fine-needle aspiration biopsy in children and adolescents: experience with 218 aspirates. Diagn Cytopathol. 2005 Apr. 32(4):189-92. [Medline]. Belfiore A, Giuffrida D, La Rosa GL, et al. High frequency of cancer in cold thyroid nodules occurring at young age. Acta Endocrinol (Copenh). 1989 Aug. 121(2):197-202. [Medline]. Hughes CJ, Shaha AR, Shah JP, et al. Impact of lymph node metastasis in differentiated carcinoma of the thyroid: a matched-pair analysis. Head Neck. 1996 Mar-Apr. 18(2):127-32. [Medline]. Millman B, Pellitteri PK. Nodular thyroid disease in children and adolescents. Otolaryngol Head Neck Surg. 1997 Jun. 116(6 Pt 1):604-9. [Medline]. Salas M. Thyroid nodules in children and adolescents. Ed. F Lifshitz. In Pediatric Endocrinology, edn 3. New York: Marcel Dekker; 1995. pp 415-422.